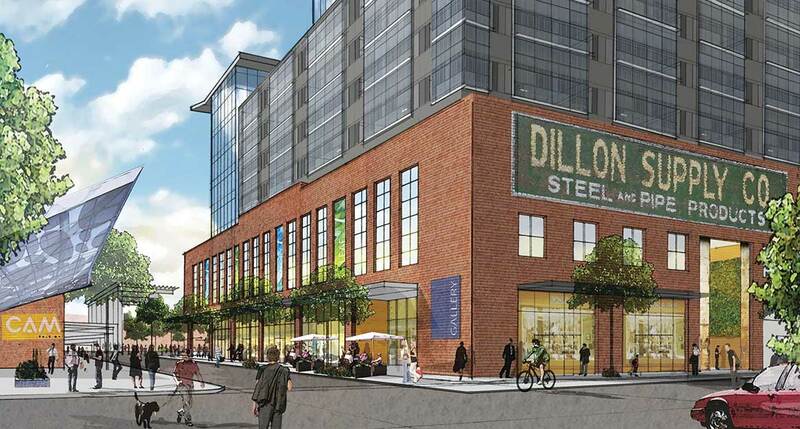 On Tuesday, Raleigh City Council voted to approve a rezoning request from Raleigh real estate developer John Kane and his firm, Kane Realty Corp., to build two new mixed-use development towers at the site of the old Dillon Supply Co. warehouse in downtown Raleigh’s Warehouse District. The project, called The Dillon, would include a 17-story commercial tower and a nine-story residential tower with the accompanying parking, retail and restaurant space on the ground floor. It has been estimated that the cost of the project would be about $150 million to build. At build-out, the rezoning application will allow about 210,000 square feet of office space, 260 apartment units, and parking deck. Kane also noted that the first phases of The Dillon could be ready for occupancy by the end of 2017. The development would be on the 2.5-acre site that Dillon Supply, a 100-year-old Raleigh company, still uses for storing its building supply products at the corner of West and Hargett streets.